Are you planning a vacation to Disney World? Wouldn’t it be cool to just pick up and go right now? In my mind, I’m there already with nothing to do to but have fun. Unfortunately, a reality check reminds me that we all have jobs, many need to consider school schedules, and finances and budgets need to be in order. Given all of these considerations, how can you possibly make an informed decision about the best time for your Disney World trip? Well, today is your lucky day because this article focuses on TouringPlans.com’s Disney World Crowd Calendar, a powerful tool designed to help you make a decision about when to go so that you spend the least amount of time in line. Plus, see a handy summary of how specific holidays and Disney World special events affect how much time you’ll be in line. 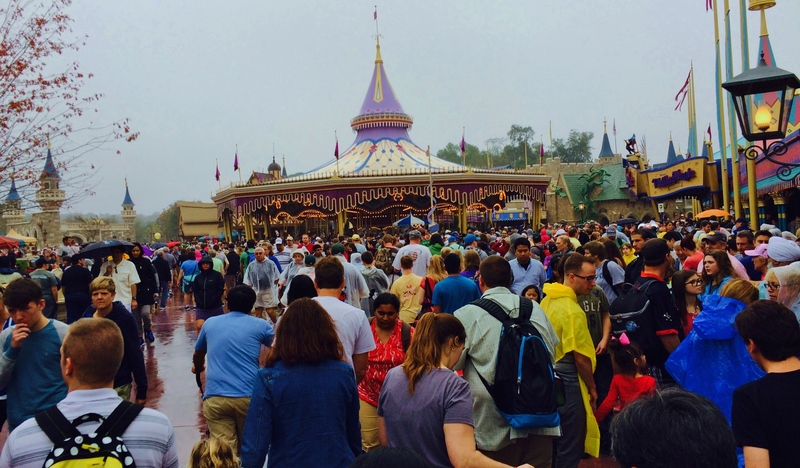 How will the crowds be during your Disney World visit? Use TouringPlans.com’s Crowd Calendar to pick the best week for your vacation. First and foremost, as with any trip, there are two basic factors that are crucial to deciding when to go to Disney World and that provide the context for using the TouringPlans Crowd Calendar. These are: (1) when you can afford to go and (2) when your schedule allows you to go. In terms of when you can afford to go, maybe your goal is to save up first, or you are expecting a work bonus to put toward vacation, or your budget will be a bit more flexible once that car loan is paid off. As for schedule, you likely need to work around school vacations, a project at work, or family obligations. Another potential factor is Disney World’s schedule. Is there a special event or time of year you would like to visit? Is it a must-do or just a bonus if it lines up with your other best times for vacation? Also keep in mind that peak crowds bring peak prices at Disney World resorts. Considering these factors is bound to narrow down the time when you will take your vacation, and this is when TouringPlans’ Crowd Calendar can become an integral part of deciding when to go. Matching up all of these factors—budget, schedule, and what you’d like to experience at Disney World—with the Crowd Calendar is an excellent way to pick the best week for your vacation. By using TouringPlans’ day-by-day Crowd Calendar, you can see what crowd levels will be like during any potential trip up to a year in advance. Here’s how it works: TouringPlans predicts crowd levels for every day of the year based on a scale of 1 to 10, with 1 being the lowest crowds and 10 the highest. For each day, there is a level for the overall resort, plus one for each park (Magic Kingdom, Epcot, Disney’s Hollywood Studios, and Disney’s Animal Kingdom). These crowd levels are based on years of attraction wait time data, with each crowd level associated with specific wait times for each attraction. 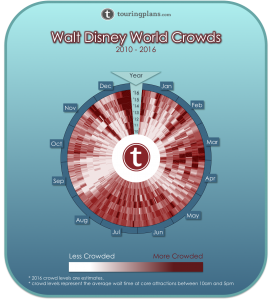 See here for information on how TouringPlans defines a crowd; plus, you can view average peak wait times for each attraction in each park. How can you use this information to decide on the time for your Disney World trip? TouringPlans.com subscribers can view crowd levels for every day up to a year in advance by clicking on the “Jump to Date” link on the Crowd Calendar page. For example, here’s a link to the Crowd Calendar for Monday, February 15. The page also shows park hours and times for shows such as parades and fireworks. From that date, you can click forward or backward to the surrounding days to see what crowds will be like for your entire trip. Go ahead and look at crowd levels during spring break versus Thanksgiving week. What would it be like to go in May versus during July or August? Would it be less crowded to plan a trip around Mickey’s Not-So-Scary Halloween Party or Mickey’s Very Merry Christmas Party? Once you’ve matched up potential dates with crowd level predictions, your decision about when to go may be obvious, especially if your main objective is simply to find the week with the lowest crowds. If there is a special event that happens to be occurring during your week, it’s a bonus. Or maybe a special event or holiday is driving the time of your vacation. In either case, read on to find out what to expect in terms of crowds for each event and holiday throughout the year. You can then use the Crowd Calendar to see daily crowd level ratings at these times. Are you planning to attend a certain Disney World event? Is an increase in crowd levels worth the opportunity to experience one of the yearly festivals or holiday parties? Maybe you want to find the least crowded time to visit during a busy seasonal event. Or maybe your goal is to completely avoid events or holidays that are expected to lead to a surge in crowds. Here’s a table that shows how special events and holidays affect attraction wait times throughout the year. At this point, I hope you have enough information to at least start deciding on a time for your visit. And once you’ve done that, revisiting the Crowd Calendar’s park-by-park breakdown is an excellent way to determine the best park to visit on each day of your trip. In turn, it provides a framework for planning out advance dining and FastPass+ reservations. For questions to consider when using the Crowd Calendar to pick which park to visit each day, see here. For those of you looking to indulge in even more information on how the Crowd Calendar works, we provide detailed historical Crowd Calendar data here. An article by Fred Hazelton previews the 2016 Disney World Crowd Calendar by month and includes a fantastic graphic, reproduced here, showing how monthly crowds have evolved since 2010. If you would like a visual of how different crowd levels actually look, Len Testa presents a series of videos showing walkthroughs of Magic Kingdom at specific crowd levels. As mentioned before, the good news is that if you are planning a trip to Disneyland or Universal Orlando—TouringPlans provides Crowd Calendars for these destinations too. I’d like to see weather adjusted touring plans for the summer. There’s no use planning to spend all day in a park if you’ll melt by noon. We’re going Aug 20th to Sept 5th this year, and are planning to stay at the Paddock Pool at SSR (or a water park) until the afternoon rain, then go to the parks after dinner. It’s our first time going in the intense heat and humidity. I am wondering if the CC says a day is a 4. Is that 4 comparable to 3 or 4 years ago or have things gotten so crowded that a 4 now would have been an 8 back then? Dave H – (I don’t work for touring plans but I’ll try to answer your question). I think the overall number of people in WDW has increased since MyMagic+ showed up, but that’s because WDW capacity has increased – essentially, now they have become more efficient at moving people through the park at peak times (due to improvements in FastPass+, the dining reservations system, increased number of attractions, etc. ), so wait times should essentially be level. You probably will see more people in the open spaces of the park (especially during fireworks/parades) but you still get to do/see/experience the same amount of stuff while you’re there. Disney knows they couldn’t pack more people in the park (and in turn, make more money) unless they make the attractions equally more efficient – people will stop buying tickets to Disney World if they can’t see the same number of attractions in one day, and that’s why they created MyMagic+. The short answer is ‘yes’, historical days use the same scale and are therefore comparable between years. However, every few years we need to adjust the scale that we use to represent the 10 crowd levels. So if you visited in 2009 on a day that was listed as a ‘5’ at the time (in 2009) you may notice that our historical database labels that day as something different, likely a ‘4’ or a ‘3’. The reason we must do that is because Disney World is more crowded on an average day now compared to years past – if we didn’t adjust the scale, every day in 2016 would be at least an ‘8’. Do you know if the accuracy of the crowd calendar is affected by how far out you look? I looked up our dates for next May, and the crowd prediction was low. When I went back and looked at the historical (actual) crowds for the same dates the year before, the number was much higher. When planning to go during Food&Wine, keep in mind that ride wait times have absolutely no correlation with how crowded Epcot will be. Most of the people there are not there to ride, but to go to Food&Wine booths. This can make it almost impossible to move around the park. We were there for the first two Saturdays of Food&Wine in 2015. The Crowd Calendar numbers looked good, but the crowds were pretty much unbearable. Yes, there is a disclaimer that the Crowd Calendar numbers don’t factor in the F&W crowds, but I don’t think most people realize this. We realized it, but were still shocked at the crowds. The table above that tries to show the effect of events on the Crowd Calendar is wildly off on the low side for Food&Wine, based on our experiences. Thanks for the great information. I’ve been researching different websites and joined TouringPlans for my first and upcoming trip in April to Disney world (8- 12th). Whilst I’ve worked out my touring plans I have found it more difficult and confusing to work out what days to tour which parks as the different websites have differing crowd levels / park recommendations, with majority of them advising to avoid the EMH parks, whilst TP park crowd tracker shows Hollywood Studios on EMH day as low crowd “green” park on 10th Apr. Any advice for an excited but perplexed first time? Hi Beck. How exciting that you are prepping for you first trip! I think visiting DHS on a day with a relatively low crowd level of 4 on an EMH day would work very well as long as you are a resort guest and willing to get up early that day. The trick is to get there before the 8 AM opening and immediately ride Toy Story and then Rock n Roller Coaster. Then see the rest of the attractions. You should be able to do this all without FastPass before crowds peak with non-resort guests. At that point, you could stick around for a few shows, take an afternoon break, and hop to another park where you can make good use of FastPass. If you don’t have a park hopper, you could use FastPass to reserve a second go on some of the DHS rides. And then it would be a good night to visit Disney Springs. I hope that helps! With the planning you are doing in advance, you’re going to have a great time. 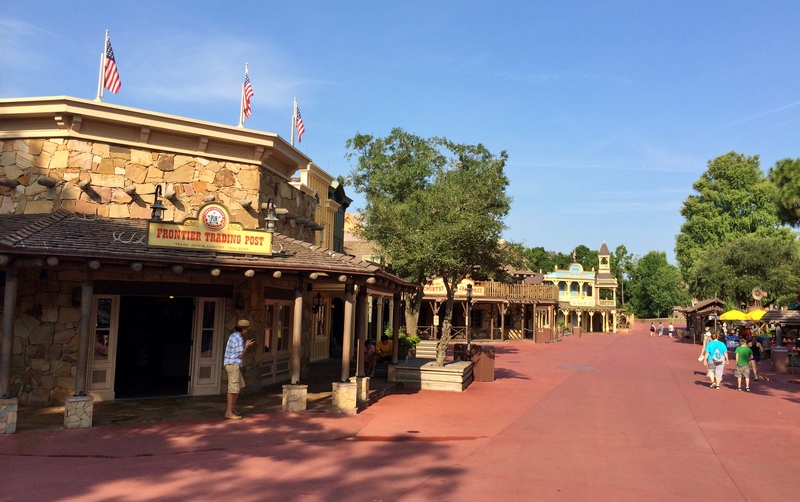 I want to know when that first picture (in Frontierland) was taken!! Does that kind of crowd (or non-crowed) even still exist?? I want to know when that first picture (in Frontierland) was taken!! Does that kind of crowd (or non-crowd) even still exist?? In regards to planning what dates would work, I would find it handy to have a calendar that gave a view somewhere in between the “zoomed in” view of 1 day at a time and the “wheel of death” that shows 6 years worth of data. Perhaps a month level view with a simple bar graph of crowd levels by day? Even better, allow the user to customize the date range. This would help if, for instance, you thought you wanted to go sometime in April or May. You could view the crowd data for those two months to get an overall picture of what weeks might be best for you. You know, I had read that post when it came out and then forgot about it. It’s a neat view, but not exactly what I had in mind. I was picturing more of a simple Excel-like chart with Resort crowd level on the Y axis and date on the X. And you could customize the date range to see the overall resort trends for a given time period. The heat map is really neat (and I’ll probably use it for my upcoming trip) but still a little too low level for answering the initial “what week of the year/month should I go?” question.